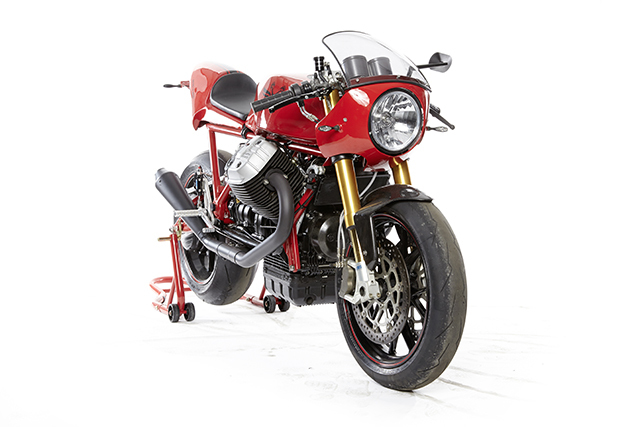 There’s not many bike builders that would buy a brand new Moto Guzzi Griso just to cut it into pieces. 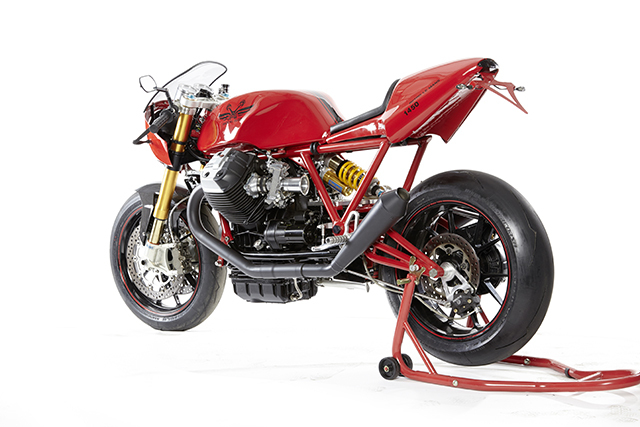 But then there’s not many customizers that are as passionate about Guzzi’s as Stefan Bronold from Radical Guzzi. When it comes to building bikes, he really aims to put the “racer“ back into café racers. Everything on the bike is there for a reason and helps to achieve Stefan’s favourite word… performance. 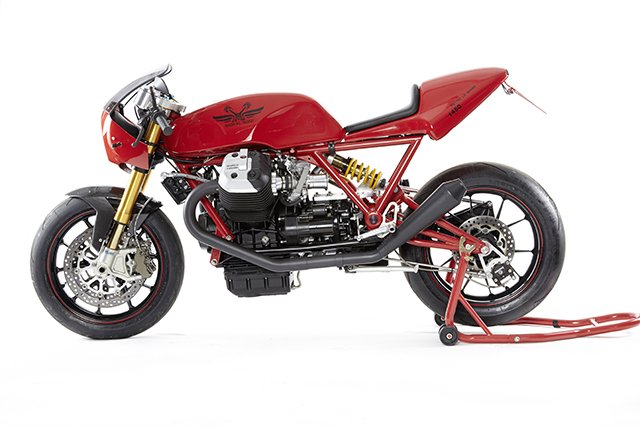 The starting point for the ‘Retro Le Mans’ project was a simple question: What kind of bike should Moto Guzzi come up with to create a similar sensation as BMW with the R Nine T? A bike combining heritage and performance. 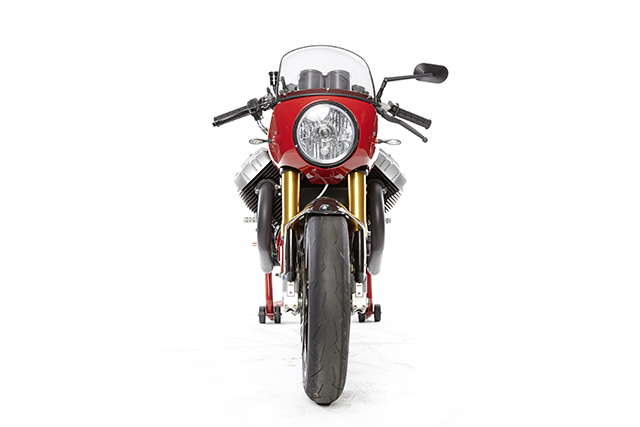 For Stefan the combination of the modern 4 valve engine with it’s powerful punch and the classic Tonti frame was the perfect base for a contemporary Guzzi in the tradition of the Le Mans models. The outcome is visually stunning, offering outstanding performance and handcrafted detail. The 1200cc engine was bored to 1450cc and delivers around about 120 – 130 HP. The chassis features a self made rear end, integrating a stabilizer that delivers a better performance than Guzzi’s stockl rear ends. 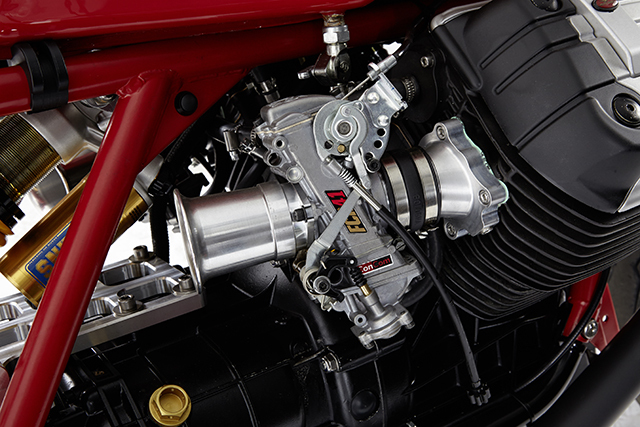 Ohlins chassis components and a Ducati 1098 front fork further improve the bike’s road performance. When asked what the most difficult part of the build was, Stefan had a hard time defining it. “Of course, the engine did not want to fit into the frame very easily” he says. He did eventually make the engine fit but there was no way of using the modern gearbox. So the ‘Retro Le Mans’ now sends its power through an adapted classic five speed transmission. Another headache was caused by the intention to do without the fuel injection in favor of carburetors. It meant adapting the round opening of the carburetor to the oval outlet of the Griso’s cylinders. The custom designed mono shock in the rear took several stages of fabrication due to unexpected powers eating up the fixing plate. The list of trial and error solutions is a long one. It is truly amazing that a bike like this could be designed without the help of computers the good old fashioned way of a hands on approach. The ‘Retro Le Mans’ is Stefan’s most ambitious custom project so far. 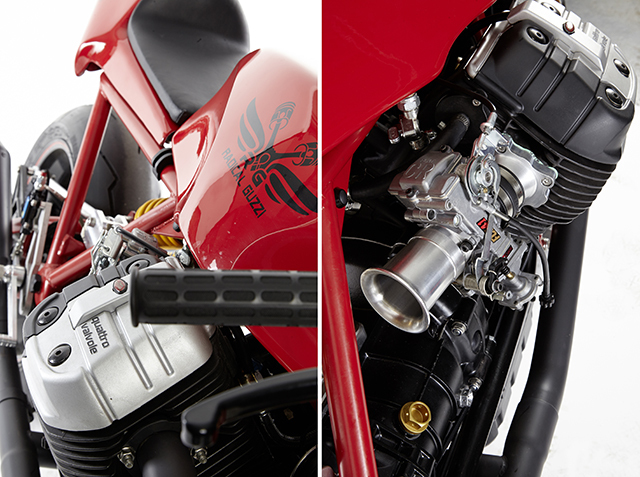 Some of the parts developed in the 6 year building process are now part of Radical Guzzi’s catalogue. If you like what you see, check out the bike in action here – it helps if you speak a little German.